This topic has 80 replies, 21 voices, and was last updated 4 days ago by chiefgrooveguru. So I’m highly tempted to add an E-steed to my quiver of weapons so I can schralp more sick loam* in my limited riding time. 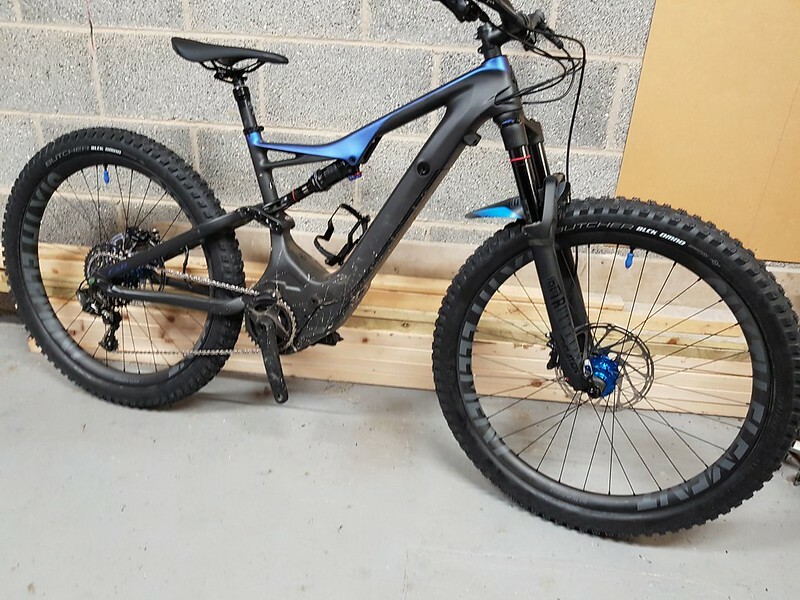 Top choice is the base Turbo Levo FSR 2019, swapping to 160mm Lyriks with 42mm offset, Hope V4 brakes and adding a BikeYoke Revive 160 or 185. Thoughts? Do all the models have the same size battery now? Used to be that the bottom 2 in the range had a ~20% smaller capacity battery than the top 2. Worth checking. Sounds entirely reasonable to me. Levos are pretty pricy for what you get and it sounds like you’re basically wanting to spend roughly the price of a Levo comp (£5k) after you’ve recouped some cash from selling the OEM brakes and fork to end up with a levo with a better fork, dropper and brakes. I’d choose guide REs over the V4s and probably go for a Brand-X 150 or 170mm dropper depending on which one will fit saving more money for the same/similar performance. 700wh battery will be fine for anyone who’s still happy to pedal regular bikes for a few hours. (and it’s noticably lighter than the larger 700w). bear in mind a lot of levo owners are less than enamoured by the performance of the rear suspension. I’ve no idea if they simply don’t know how to set-up a shock properly, maybe are out of the weight range and the shock is struggling or if it’s a mismatch with the OEM shocks/tunes and LC of the levo. Haven’t really looked into it but the same moans were present with 2018 levo owners too. The REs are 4 pot, the Rs would be 2 pot I guess. I’m happy with my REs, only once had an issue where I couldn’t lock the rear up when I wanted to on a mega steep singletrack section in the Alps. If you can put up with a 2018 Turbo Levo Carbon, I rode both the 2018 and 2019 before choosing the 2018 on discount, Rutland were offering a further 10% of over the weekend and yesterday, putting the price below £4k. Still a lot of money but a big saving over new. I have upgraded my wheels to Sixth Element and tyres from Grid to Blck Dmnd. My daughter gave me a shorter Hope stem but not got round to fitting it yet. Not had any problems with the rear shocks, just set them up the same as our Stumpjumpers. Got a new set 29er carbon Rovals on the garage wall that will probably go on the 2017 Turbo Levo once we decide which tyres will fit for the best clearance. Alex following your post i did a bit of googling – there are some decent deals out there! i can se this being a hot topic at hte weekend. I’m fighting the urge for one at the moment. Personally the only Levo that interests me is the S-Works one, but at £10k, there is no way on earth I would consider it, despite the nice integration they have. I’m looking at the Vitus, Canyon or Commencal. it’s only between the Vitus and Canyon for your riding Hob Nob. Check out Canyon’s recommended use and what they’ll warranty it for. Colp my REs are on Uberbike Sintered and working well. I tried Uber race matrix in my DH bikes and didn’t really think they were much of an improvement over the sintered. Just picked up a 2019 base levo, swapped forks (42mm offset 160mm Yari) brakes (guide RE) and dropper (ooneupcomponents). Been doing all sorts of mannys, turn bars and jumps on it. Rear shock feels great too, opened up the air can to install volume spacers, it’s rammed full with them stock, I’m sure people looking for a comfy sofa might find the ramp up too much if they’re looking for “plush”. it’s **** happening… isn’t it? Strange your mate’s not getting on with the Revive, love my 185mm jobbie, did an on-bike bleed when I got it and 3 months later I have yet to have to do it again despite some big rides in horrific clart. It also returns plenty fast, not quite the ‘plum slapper’of the spesh command post but perfectly quick enough. Maybe get it looked at. Looking forward to seeing the Levo in action. I expect it’ll raise a few eyebrows amongst some of the locals! (I have a Revive 185mm on my Spitfire and have only had to revive it twice – once when new and once when I moved the post when it was hanging on the vertical stand in the garage). Pics to follow when it’s built – they’re waiting on the fancy bits for the custom build. Guess I need some pedals too – is there anything out there that feels as good as a DMR Vault? Seeing how your first question panned out. I’m going to go out on a limb and say. No. Ha! I’ve had a look at the Nukeproof Horizons and they’re narrower than the Vaults – I know it’s only 5mm but I already ride with my feet as wide apart as I can (if I was in charge every MTB would have an 83mm BB) – my conventional deadlift stance is similarly wide. The One-Up pedals are wide but they’re convex not concave – I’ve had flat flat pedals and I don’t like them as much as the fairly heavily dished Vaults. If I go with the Vaults I’ll fill them with marine grease from new! Apart from the DMR V twins that our daughter rides with 99% of the time apart from Hopes at Bolehills with the dirt bike we have a multitude of pedals in the garage. I’m still a fan of my old Pro Mags due to the small platform, don’t know what I will do when they give up on me. We have a mixture of Vaults, V12s, Hopes, Burgtecs, Bennies and Boomslangs. The Boomslangs are by far the best grip of them all but are too big for my feet and need a special tool to service, the pins are like puppies teeth and make a right mess if they catch you. The Burgtec have the least grip by far and if they hadn’t been bought as a present would have been sold by now. I’ve been curious about the Boomslangs for a while. I don’t like the pins in the middle so they’d have to come out but if they’re wide enough, thin enough and durable they could be a good choice. Thinking of putting a Hillbilly 29×2.6 up front straight away, looks a good size (same as a Shorty 2.5?) and a nice compromise between the Shorty and DHR2. Our set has been clattered all over the UK and Europe, not had to service them yet and were bought when they first came on sale, don’t tend to see much of a discount on them. I’d consider the black diamond casing (BLCK DMND is stupid to type and read!) on the back but it’s probably overkill for me on the front as I currently ride Maxxis Exo both ends and rarely have problems. Eliminator looks good as an in between but too tightly packed for serious mud. You won’t have any problem running Exo on an Ebike either. All the drama about needing thicker casings is nonsense. You’ll descend using exactly the same lines as you did on your regular bike once you get stronger and used to the extra force needed to preload, manual, jump and pump it. Don’t be tempted to go super soft on rear compound either, Yes they’ll allow you to be a lazy **** and not bother weighting the bike properly to find grip when boosting up the unclimbable but they’ll also make it an absolute **** chore to pedal above assistance limit and knock a chunk off your battery range. I’ve found I prefer how the harder Maxxis Dual compound feels on the back, compared to the 3C MaxTerra – it’s less squirmy on hard ground, especially in berms, and stays sharper edged and thus grippier for longer in the soft stuff. As it’s coming with a pair of Butcher Grid Gripton 2.6 I’m planning to run them out back, hopefully they won’t be too soft. Also, I want a tyre that still rolls – so many trails will be quicker than the motor will assist, if I even leave it on for descending. Hearing positive things about the new Michelin tyres but that Hillybilly looked and felt good in the shop. I run dual compound or 60a F&R on all my bikes. Pablo updated Blevo to be compatible with 2019s but faster rolling tyres will still be nicer on the flat even with it installed. I hope you’ll be winding Rob up with it later? It’s definitely a thing Chief. a well known local ex professional mtb rider passed me the other day at inners being towed by a strap by another rider on a Haibike Emtb. post pics. What size did you go for BTW? I’ve gone for a (medium-sized) large. 455mm reach, same as my Spitfire full-sus and Zero AM hardtail. Felt nice, chuckable monster truck! Also ordered a tow rope*.